China frequently protests military operations in its Exclusive Economic Zone, the area adjacent to a country’s coast in which it has economic rights. 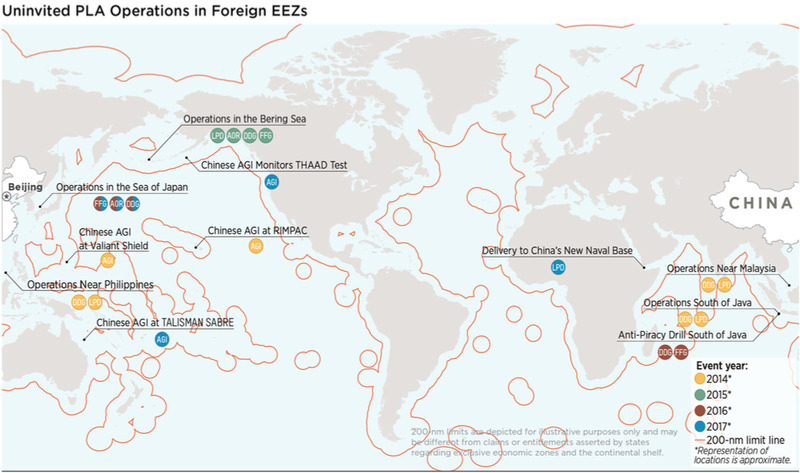 But China doesn’t appear to have reservations about conducting its own military operations in other countries’ EEZs. The US and others continue to use military operations to contest Beijing’s expansive claims in the South China Sea. China’s expansive claims in the South China Sea and its broad interpretations of international law often lead it to protest what many other countries consider to be normal naval maneuvers in the area. But farther afield, Beijing’s activity indicates that it doesn’t abide by the standard it applies to others. The US and other countries have countered that the UN Convention on the Law of the Sea, or UNCLOS, permits military activity inside EEZs. (The US is not a signatory to the UNCLOS.) An international tribunal has also ruled that China’s claims in the South China Sea have no legal basis. In addition to its protests about military operations inside its EEZ, China has also protested ships passing within the territorial waters – which extend nearly 14 miles from a coast – of disputed islands in the South China Sea where China has constructed military facilities. The international tribunal also rejected those claims. According to the US Defence Department, however, China’s People’s Liberation Army Navy has carried out a number of military operations inside the exclusive economic zones of other countries, seemingly contradicting the stance it takes in waters closer to home. 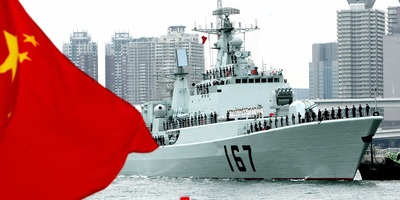 “Although China has long challenged foreign military activities in its maritime zones in a manner that is inconsistent with the rules of customary international law as reflected in the [law of the sea convention], the PLA has recently started conducting the very same types of military activities inside and outside the first island chain in the maritime zones of other countries,” the department said in its annual China military-power report, released this week. “This contradiction highlights China’s continued lack of commitment to the rules of customary international law,” the report adds. Since 2014, the Chinese navy has conducted what the Defence Department refers to as “uninvited” operations throughout the Pacific and Indian Oceans. In 2017, a Chinese spy ship entered Australia’s EEZ to observe US and Australian ships during military exercises; entered the US’s EEZ around the Aleutian Islands, in what was likely an attempt to monitor testing of the Terminal High Altitude Area Defence system; and carried out air and naval operations inside Japan’s EEZ. Chinese naval vessels also carried out a delivery to Beijing’s base in Djibouti, which is China’s first overseas base and is near a major US outpost. This year, China dispatched a spy ship to monitor the US-led Rim of the Pacific exercise around Hawaii, as it has done in years past, after the US rescinded Beijing’s invitation to the exercise over the latter’s actions in the South China Sea. The US and other countries involved in those incidents have not protested the presence of Chinese ships in their EEZs, seeing it as allowed under international law. Some have cited China’s presence in foreign EEZs as justification for similar movements in China’s EEZ and as a tacit acknowledgement by Beijing of those rules. In the South China Sea, the US has continued to carry out freedom-of-navigation operations around disputed islands, in part to show it does not recognise China’s claims there as valid under international law. Days after one of the most recent FONOPS, as they are known, Defence Secretary Jim Mattis promised more and underscored their significance.